Activator iOS 7 jailbreak tweak has been updated with new features and functions. The developer of so many Touch ID based tweaks, Ryan Petrich, has now released a beta version of Activator adding some new features for iPhone 5s users. Activator iOS 7 jailbreak tweak lets you use Activator for any action. 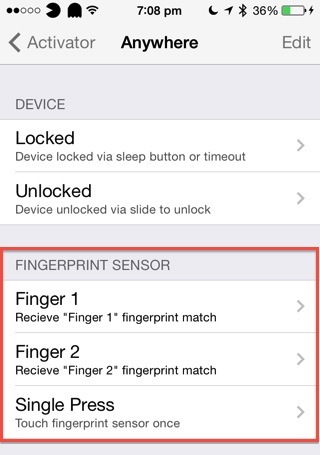 Now updated to the beta 1.8.4-beta2, Activator iOS 7 helps the iPhone 5s user by adding an Activator action for each fingerprint set in Touch ID. This will let you exclusively specify actions for your fingerprints. Set up an app action for your thumb print and set another fingerprint to send a mail. Add Ryan Petrich’s repo in Cydia from this link and install the latest Activator version. Or update to the latest if you have already installed Activator. More iOS 7 jailbreak tweaks: Messages Customiser: Customize Messages App with iOS 7 Messages Tweak, *Compatible iOS 7 Jailbreak Tweaks and Apps for iPhone 5s – UPDATED LIST, *Updated iOS 7 Jailbreak Tweaks – 3D Animation, Hidden iOS 7 Menus, App Switcher, and More! Favorite iOS 7 Tweak Barrel Updated with New Animations!